Ever wonder why caregiving gets so little attention and informal caregivers like you are so often underappreciated? There are no standardized tests to determine who can become an informal caregiver. Our culture adores standardized tests because they provide an easy way to measure ourselves against others. Ideal candidates for care, however, don’t have to know any specific type of information but they do have to possess one undeniable trait: the ability to constantly adjust and adapt. Instead of responding to abstract questions, resilience and adaptability are the key markers for admission. It’s easy to compare IQ scores but nearly impossible to compare scores of resilience. People with high IQs feel compelled to tell you about their numbers, whereas resilience and care are always demonstrated. You don’t need to tell anyone you’re resilient, others around you just know. Instead of a cover letter showcasing the ways in which your intelligence, experience, and training mean you are one of a kind, caregiver cover letters would feature our insecurities. This type of letter would require an acknowledgment of our weaknesses. Our fears and frailties would play center stage. These parts of ourselves are prerequisites for care because they allow us to empathize with others. Any references to future outcomes would surely disqualify someone from the caregiver role. Caregivers don’t begin this journey out of self-interest. We don’t work in the realm of outcomes. We live in a world of doubt and hesitation where the future is about the next hour, not a strategic plan to climb the corporate ladder. The only ladders caregivers want to climb are to get us closer to someone we care about, they’re not designed to get us out of a situation. There are no fancy promotions or ceremonies marking your performance. Days, months, or even years may pass without anyone paying any special attention to your efforts. Few will recognize your years of service, effort, impact, performance, or capacity because there is no special hierarchy differentiating one caregiver from the next. And there aren’t communal commemorations because caregivers rarely associate with one another in person. Rarely, if ever, will you hear caregivers speak of themselves as a class or group. Caregivers don’t allow themselves the privilege and comfort of the “we” because there is no union of caregivers, simply a legion of “I’s” doing and being and serving. Parents and relatives and friends won’t be able to brag about your experiences. There are no “schools” of informal caregiving—no Harvard or Stanford to use as a guiding goal from which others can respect and admire. Others may speak highly of your role and your efforts, but it begins and ends there. There is nothing for outsiders to show their support of your value—no jersey to buy that binds you to another, no bumper sticker that highlights your efforts, no stock market of care that would legitimate your endeavors. The caregiving role doesn’t mean you are heading to an exotic location for your hero’s quest. The excitement and mystery of heading off into the world isn’t part of the caregiver role. Care isn’t found far away. It’s up close and personal. Inspiration doesn’t come from the exotic. It comes about because of shared relational history. There are no fancy orientation sessions preparing you for what is to come and how to respond. We don’t have the luxury of getting ourselves (and others) ready for what is about to come–“In three months, I’m going to be a caregiver.” The caregiving role can’t be planned. We respond to it before we even know we’re in it. 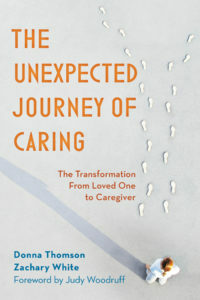 You don’t step into the caregiving role, it steps into you. There are no alumni “homecoming” parties. There are caregivers next door, down the street, down the hall, and in the next cubicle. But their efforts often go silent and unnoticed because there are no parties or reunions to mark them and their role. Caregivers often think their role is so unique that they have little in common with those in the same situation. Where would they return to? What would they say to their children about how the experience of care changed them when care is not bound to any one place? Care isn’t something that happened to us during a certain year, it’s something we still live with. For caregivers, the where is always secondary to the who because it’s nearly impossible to explain how you were changed when care changes every part of how you see yourself. One day, perhaps soon—caregivers will begin to be valued because it’s a role that will come to us all at some point in our lives. It is the one transition in life we all experience—just not at the same time. I dream of the time when our culture will boast of care and caregivers with the same pride it speaks of someone who has made it into a prestigious school or works for a highly-acclaimed employer. Then, and only then, will we begin to know our care experiences have achieved the status they deserve. So interesting. Recently, I’ve been speaking with my friend and colleague Julie Keon who is herself a complex disability Mom and author of a terrific book called What I Would Tell You. Julie is a life cycle celebrant. She creates rites and rituals for birth, marriage, funerals and she is a doula for both births and deaths. I am going to ask Julie what she would suggest in the way of a ritual/celebration for caregivers. Perhaps something could be built in to the qualifications for caregiver coaches and patient/family navigators. I don’t know, but you’re right – something has to change to give a public demonstration of the value of caregiving. Zachary, thanks for this fine and thoughtful post. What you write of course applies so well to caregivers, but I think it also applies to anyone who is willing to think about these questions: what does a good life look life? what kind of a person do I want to be? Thank you for helping us be aware of and think about these questions. Thank you, Norris. Thanks for highlighting the universality of these questions. Questions that I know you have much to say about. I very much appreciate your support. Thanks, Donna. You and Julie are visionary care advocates. Looking forward to what you and Julie comes up with as we all share a belief in the importance of marking care with ritual and acknowledgment. Thanks for the ongoing support.